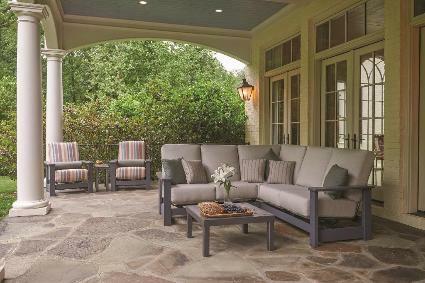 In response to the phenomenal success of our Leeward Sling Collection and continued demand for comfortable deep seating furniture, Telescope Casual has created a Leeward Deep Seating Cushion Collection, which still utilizes a frame constructed of super high quality marine grade polymer. Combining this high quality material with extra deep plush cushions preserves the style of its original sling collection while adding optimal comfort. Shown in Photo: (2) Hidden Motion Arm Chairs, (1) Corner Fixed Section, (1) Left Arm Two-Seat Hidden Motion Section, (1) Right Arm Two-Seat Hidden Motion Section, (1) Chaise Table and (1) 28.5" Square Coffee Table. All items are sold seperately. Colors in Photo: MGP Frame Color - Graphite. Sriped Cushion Fabric: Glimpse Canyon, Solid Cushion Fabric: Cast Silver. We have the fabric swatch books at our store for you to choose from when ordering. Throw pillows are not included but can be purchased seperately.